It became uncomfortably apparent to me a few weeks ago that I am one of those people. You know, the kind that “pack” for a trip to the store. It started out innocently enough, with my list. A full sheet of notebook paper. Then I needed to get my gym bag ready. Wallet, book, water, socks for Jordan so she can play in the playscape and I don’t have to hear about how she “couldn’t play with her friends and it was the WORST DAY EVER” because she was in flip-flops. But, since I hate going anywhere sweaty, I needed a change of shirt. And my own flip-flops because it’s 100 degrees and I ain’t wearing tennis shoes until noon. Gotta bring my purse for the shopping part. Pack that next to the gym bag. Oh, and since Jordan is coming shopping, she’ll need a snack. Come to think of it, so will I. Two granola bars into the purse. Oh yeah, she’ll want water too. Then I have to pack Jordan’s wallet. She likes to bring her own money. Because she treats her stuff like crap and has to buy herself new headphones because who knew that you can’t step on headphones? Before I knew it I had enough stuff I could have spent the night in the Wal-Mart. Which, I guess, is likely because by the time I shop, rearrange the cart four times, get Jordan three snacks, let her look at clothes, fight that no we cannot buy the Lego house, and get through the line, I feel like I’m never going to get home. So yeah, I’m now that person. If you see me at Wal-Mart, you can bet I’ll have extra snacks. All you have to do is ask. 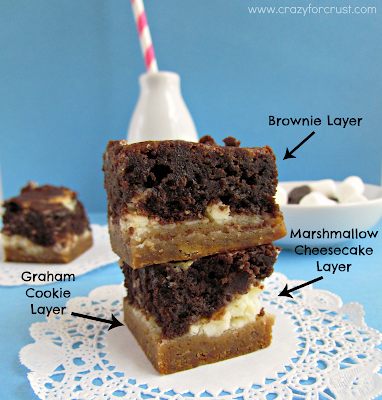 When I started thinking about how to make a “different” kind of S’mores Brownies, I immediately thought of doing a graham cracker crust; not the ground up kind, but an actual graham cracker. The marshmallow was perplexing to me because whenever I’ve baked with marshmallows they disappear in the oven. So I decided to do a sort of cheesecake filled with fluff. The result? Well, they don’t taste like your traditional s’mores. The graham gives it a slightly spicy base and the cheesecake tastes like cheesecake. 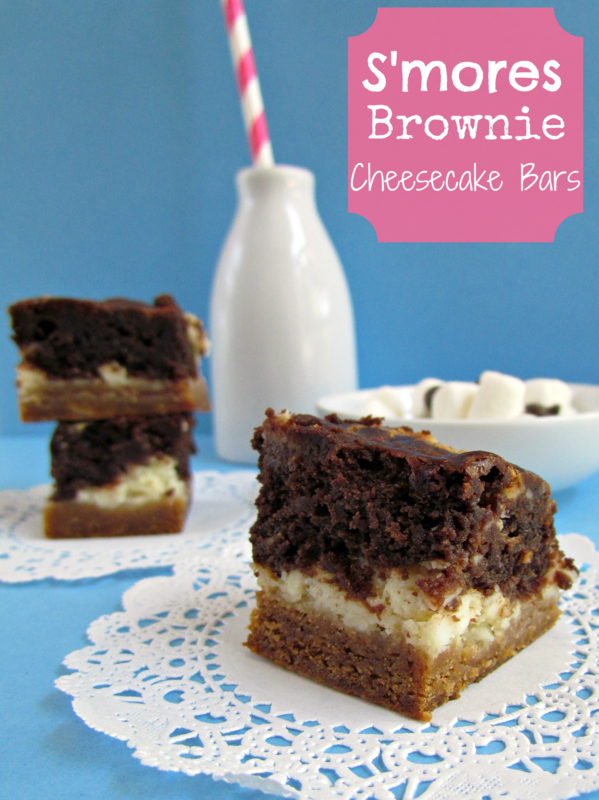 The brownies are absolutely out of this world. I need to make Joy’s brownies again, but by themselves. And then I’ll hoard the pan and not share with anyone. Oh, and this makes a ton of brownies. I know it’s a 9×13″ pan, but they seemed to multiply like Jordan’s toys on my living room floor. I guess because they are very rich, thick, and chewy. Didn’t stop me from eating four. Or eight. Graham cracker recipe from Smitten Kitchen; brownies adapted from The Joy The Baker Cookbook. Line a 9x13” baking pan with parchment paper. Preheat oven to 350 degrees. Make the graham cracker layer: pulse flour, brown sugar, baking soda, and salt in your food processor. Add butter and pulse until the mixture is crumbly. Whisk honey, milk, and vanilla in a separate bowl. Add to the flour mixture and pulse until dough comes together in a ball. Press into prepared pan. Chill until ready to use. Make the cheesecake layer: beat egg, fluff, and cream cheese with a hand mixer. Pour over graham layer. Return to refrigerator until brownie layer is complete. Make the brownies: whisk together flour, baking powder, salt, and coffee. Set aside. Place butter and chocolate in a heat-proof bowl over a pot of simmering water (do not let the water touch the bowl). Stir until the butter and chocolate are melted together. Let cool for a few minutes, then whisk in eggs, one at a time. Whisk in vanilla. Add flour mixture and stir until combined. 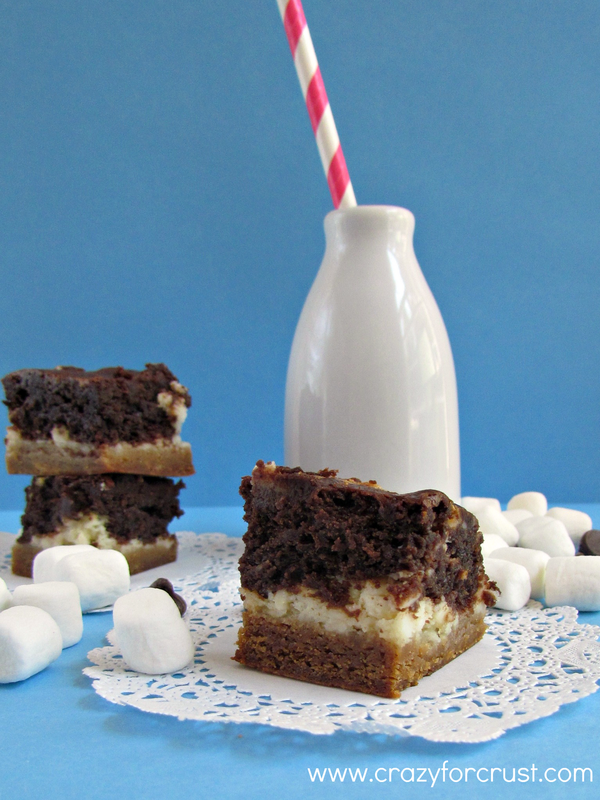 Pour over marshmallow cheesecake layer. Bake for 40-45 minutes until a toothpick comes out almost clean. The center will still be a little soft but you will be able to tell that the edges are done because the cheesecake that pokes through is browned. Cool completely before cutting. You can get your own copy of Joy the Baker: 100 Simple and Comforting Recipes here. Get a copy and join us in making as many as our stomachs can handle! I link up to all of these fabulous parties each week! Chef in Training, Trick or Treat Tuesday, Cast Party Wednesday, Sweet Treats Thursday, Chic-and-Crafty, Tastetastic Thursday, Sweet Tooth Friday, I’m Lovin’ it Fridays, Sweets for a Saturday, A Well-Seasoned Life, Strut your Stuff Saturday, Weekend Wrap Up Party, Weekend Potluck, and all of these too! This is truly a masterpiece Dorothy! I want one right now 🙂 Featuring tonight! Thanks for sharing at Mom On Timeout! These look SO GOOD! What an incredible recipe! I love it! Brilliant! I just made this today and it turned out great! The marshmallow cheesecake was unlike anything I had seen and your was the most unique of any smores brownie recipe I had seen so of course I had to try it! I did omit the crust (not enought graham crackers:( but did sprinkly crushed crackers on top. Like I said, they turned out great! Thank you for such a wonderful recipe! Pingback: Happy National S'mores Day! | What's New? What's Hot?